I originally drew this image in black and white as a "shout out" to my youngest son in his elementary school year book. It was a fun option the school offered, and it became a tradition of mine to do some kind of PMD illustration wishing my kids well as they moved on to middle school in their year books. This was the last one, and probably my best, with Plunger Monkey having "evolved" considerably in the way I drew him. Even in black and white, the cat was always going to be purple, as it has always been, and continues to be, my youngest son's favorite color. He also happens to love cats so much that in his younger years, as a means to cope with his social anxiety, he would frequently meow and crawl around the class room. I don't even know how many phone calls and emails and teacher meetings I dealt with during his elementary school years for that. Plunger Monkey's sign originally said something specific to my son and his moving on to fifth grade, which obviously needed to change when I decided to color this and make it a shirt. 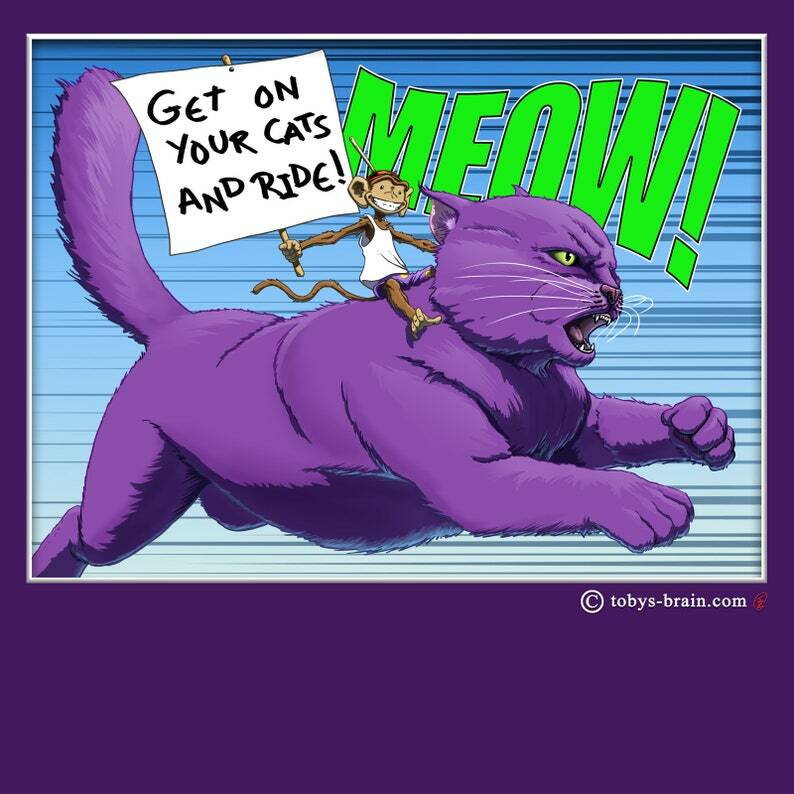 I went with "get on your cats and ride!" as a bit of a nod to Queen's Fat Bottom Girls' line "get on your bikes and ride". I love Queen, therefore so does Plunger Monkey, and it just seemed to fit. Beautiful Tee! Good quality shirt. Love it!